Well, it’s starting to look like your favorite giant movie ape is going to have a bunch of new playmates to throw around in a fit of simian rage. Earlier today we learned that Brie Larson has signed on as the female lead in Kong: Skull Island, and now it is being reported that Russell Crowe is being eyed for a key role as well. I could see him getting angry and trying to fist fight King Kong, I’d pay to see that. According to The Wrap, the Oscar-winning Australian actor is set to join the big-budget, special effect-heavy movie from Legendary Pictures. Should he ultimately wind up signing on for the project, he would join Larson and Thor star and general Marvel Cinematic Universe villain, Tom Hiddleston. Skull Island has undergone some substantial upheaval as of late. The production recently lost two high profile actors who figured heavily into 2014’s end of the year awards race, Michael Keaton and J.K. Simmons. Both left the film a few weeks ago due to schedule conflicts, and though there are no details about the role Crowe might play, the report indicates that it is as a replacement for one of those departed performers. That said, Crowe has reportedly not even read the script yet. As it stands, the script is reportedly going through another draft right now from John Gatins and Max Borenstein. The latter of these two is man behind Gareth Edwards’ 2014 Godzilla reboot, so he has some giant monster experience to work with. Director Jordan Vogt-Roberts (The Kings of Summer) and company did have eyes on starting production this fall, but with all of the new delays and setbacks, it looks like filming may not start until early next year. 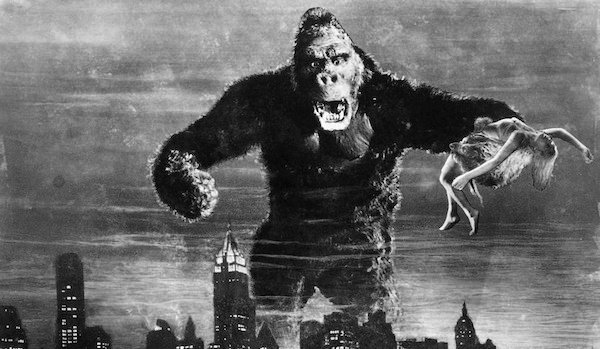 There’s not a ton known about the plot of Skull Island just yet, though while most King Kong movies only spend a little bit of time on the titular island where the giant ape and a bunch of other creatures lost in time hang out, this one is primarily set there. What action doesn’t take place on the island reportedly goes down in early 1970s Detroit, so getting from one place to the other is going to be an interesting story to follow. Kong: Skull Island doesn’t bring the huge CGI spectacle to theaters until March 10, 2017, but if you want to see the cast before then, don’t worry, they’ll around. Tom Hiddleston pops up this fall in Guillermo del Toro’s haunted house tale Crimson Peak, Brie Larson can currently be found in the Amy Schumer-scripted Trainwreck, and as for Crowe, he just wrapped The Nice Guys from Iron Man 3 director Shane Black.